What's the best upset pick in this year's NCAA tournament? Which one should you avoid? Our experts explain which lower-seeded teams they like to win first-round games. As you've studied your bracket in the time since the selection show on Sunday, one question likely has consumed most of your thoughts: Which upsets should I choose? This is the question that gnaws at every bracket-filler, and its answer could be the deciding factor in your office pool. While we probably won't see a No. 16 seed take out a No. 1 seed this year, the games between No. 12 and No. 5 seeds are always tempting, and there are a handful of other matchups between low-seeded mid-majors and high-major squads worth considering. A panel of Sports Illustrated writers and editors provided some insight into how they're approaching the group of possible upsets. These are two teams that have been going in opposite directions for a while now. The Bluejays got into the top ten of the polls behind a high-octane offense, but they plummeted after they lost point guard Maurice Watson to an ACL injury. Rhode Island, on the other hand, fell out of the polls after a few early losses and struggled with some injuries midseason, but they got healthy and hit their stride, winning the Atlantic 10 tournament. The Rams are better than their seed indicates. How can’t you feel excited about Giddy Potts? He and Middle Tennessee pulled off the stunner of the NCAA Tournament last year, deposing of No. 2 Michigan State. Now it’d be a surprise if Giddy and his band of Blue Raiders don’t pull off an upset this season, as Middle Tennessee is just a slight underdog against Minnesota. What makes Middle so much better this year? Leading scorer JaCorey Williams (17.3) is a transfer from Arkansas who sat out last season. He, Potts and Reggie Upshaw average more than 14.5 points per game. After suggesting this first in a Midwest Region preview and then scoping out other upset possibilities, the Rams remain a pretty good bet. Danny Hurley's defense ranked second in the country in allowing just 29% shooting from three-point range. Creighton doesn't lean exclusively on that weapon (189th nationally in three-point attempt rate) but it needs some production on the perimeter to be efficient. And having faced Cincinnati and Duke earlier this season, Rhode Island won't be shaken by the moment. The Atlantic 10 champions enter the tourney riding a season-high eight-game winning streak. The Bluejays, meanwhile, are just 7-8 since Watson was lost for the season with a torn left ACL in mid-January. Watson, a senior and a Wooden Award candidate who led the nation by averaging 8.5 assists per game, was exactly the kind of steady and talented player who could carry his team through a bracket. With him gone, junior Marcus Foster, a Kansas State transfer, has had to carry an even bigger burden of the team’s offense. Rams junior guard E.C. Matthews, the team’s leading scorer at 14.9 points per game, might be the best player on the floor, and he’ll have extra motivation now that he’s playing in his first NCAA tournament game after having worked his way back from the knee injury that cost him all but one game of last season. We watched the Blue Raiders take out No. 2 seed Michigan State a year ago in one of the biggest first-round upsets in tourney history. This year Kermit Davis’s squad shouldn’t have much trouble pushing past a Minnesota team that has dropped two of its previous three games and didn’t deserve a No. 5 seed. Middle Tennessee shoots it well from both sides of the arc and it does a good job ending defensive possessions with rebounds. The Golden Gophers really guard, but they won’t be able to hold down Giddy Potts and Co. long enough to avoid being picked off. 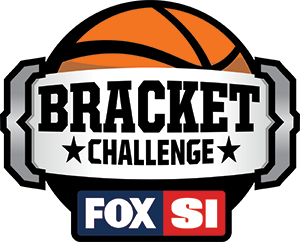 Fill out a perfect bracket, win Cousin Sal’s L.A.-area home. The Eagles play fast, clean the glass and have a big-time scorer in Keon Johnson (22.5 points per game) that won’t be afraid to play heroball in crunch time. They’re loaded with upperclassmen, and their only two losses of 2017 came in overtime. I don’t know what to make of Butler, who beat Villanova twice but enters the tournament on a two-game losing streak. This one will definitely get fun if the Bulldogs struggle to get separation early. The Seminoles are big, they’re athletic and they’re deep. So this one might actually be a little crazy. But this is a better version of the Dunk City than the one that raced to the Sweet 16 in 2013. The Eagles’ Brandon Goodwin (18.2 points, 4.6 rebounds, 4.0 assists, 51.6% field goal shooting) has a chance to become one of the tournament’s breakout stars. This game is in Orlando, so this is one case where a much-higher seeded team will not have a home court advantage. Florida State has impressive depth and offensive talent (freshman forward Jonathan Isaac is a lottery pick), as well as a 12-man rotation. However, unlike a lot of mid majors, FGCU has both the speed and size (in the form of forwards Demetrius Morant and Marc-Eddy Norelia) to hold its own against a high-powered ACC team. Sprinkle in a little March Magic and you've got the makings of a wacky upset. I’ve always been an advocate of picking upsets that won’t burn your bracket for three weeks. For example, if you think the injury to Oregon’s Chris Boucher limits the Ducks’ long-term potential, why not pick No. 14 Iona to beat them? (I didn’t, for the record). Perhaps a better team to profile for an early exit is Baylor. They’ve gotten dumped in consecutive first round games by No. 14 Georgia State and No. 12 Yale. Picking No. 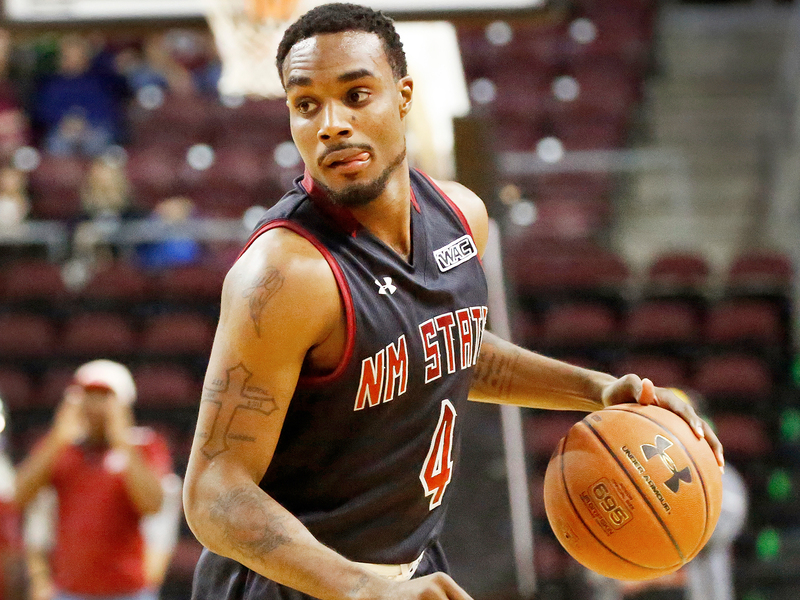 14 New Mexico State to pull the upset is logical, especially if you have No. 6 SMU beating them in the following game. It would be tough to actually pull the trigger on this, given that the Fighting Irish might be more sleeper Final Four contender than first-round upset material. But the Tigers haven't lost since Dec. 20, they rank 50th nationally in three-point field goal percentage, 46th nationally in adjusted defensive efficiency and their adjusted tempo ranks 336th. In other words, they can truly gum it up against a free-flowing offensive team like Notre Dame, which has the 16th-most efficient attack in the nation, while also knocking down enough daggers from the perimeter to stagger a higher seed into oblivion. Yes, the Seahawks gave Duke a scare in last year’s first-round matchup, and yes, they have an offense that ranks 18th nationally in efficiency, according to kenpom.com, and yes, they have four players averaging better than 12 points per game. But UNC Wilmington played just one high-major team this season, and lost by 14 to a Clemson team that is in the NIT. This is to say nothing of the fact that Virginia is pretty darn good. The Cavaliers lead the nation in adjusted defensive efficiency, and they will impose their preferred, slow-down style on this game. Tony Bennett’s club was good enough to beat Louisville twice, as well as North Carolina, among other impressive wins, and it lost three games in overtime, not including when it took No. 1 overall seed Villanova to the wire on the road before losing on a tip-in in late January. They’ll play focused, and advance. The Aggies lorded over the WAC under previous coach Marvin Menzies (who left for UNLV in the off-season), and their dominance has continued under Paul Weir, who was promoted to replace Menzies last April. Weir’s guys excel at hitting the offensive glass (they pull down 36% of their misses, good for 18th nationally), a trait shared by the Yale squad that slayed the Bears in the first round in 2016. Baylor collects offensive boards at a higher rate than New Mexico State, but it’s still trying to regain the form that helped it capture the No. 1 ranking in the AP Poll in early January. West Virginia has the best turnover margin in the country by a mile; Bucknell is … just O.K. at holding onto the ball, averaging 13.3 turnovers per game and sitting just outside the top 100 in assist-to-turnover ratio. The logical call would be to assume the Patriot League champs get pressed into oblivion by a more athletic team. But I’ve been a sucker for the Bison against Big 12 teams since long before West Virginia joined the Big 12, and Patriot League Player of the Year Nana Foulland might be a funky matchup to deal with inside. Flashbacks to Stephen F. Austin running Bob Huggins’s team out of the gym last March leave me skittish about the Mountaineers. If there was any logic behind it, it wouldn’t be a little crazy. Which lower-seeded team stands the best chance of advancing past the first weekend? I will stick with Florida Gulf Coast because I like the second-round possibilities. The Eagles will either face a Xavier team that lost its starting point guard, Edmond Sumner, to an ACL injury, or they will go against a Maryland squad that played poorly the last month of the season because the three freshmen who have been starting all year hit the proverbial wall. FGCU lorded over the Atlantic Sun all season. This is a talented, experienced team that is used to winning. The three best double-digit upstarts to consider advancing past the first weekend are No. 13 East Tennessee State, No. 12 Middle Tennessee and No. 12 Nevada. (No. 11 Rhode Island and No. 10 Wichita State actually have the best chances, but they are high profile programs, so it seems a bit lame to pick them.) The best bet is likely Middle Tennessee, but you won’t be alone in picking them to get there. Imagine them barnstorming the Memphis regional with UNC, Kentucky and UCLA. That would be fun. This year, the Blue Raiders beat Ole Miss and Vanderbilt and lost by three to VCU. They have three double-digit scorers, which gives them a cushion should one of the main offensive outlets falter. And while Minnesota (the first-round opponent) and Butler (a possible second-round foe) have had their moments, both teams also have hit stultifying lows along the way. Both are susceptible against a lower-seeded team that won't be impressed by major-conference pedigree (see: Michigan State upset, 2016) nor overwhelmed by the NCAA tournament experience. Middle Tennessee, in every way, has been there before. There are no players left who played for the Shockers in their classic matchup with Kentucky in the 2014 NCAA tournament, when a callow Wildcats group ended Wichita State’s unbeaten season in the Round of 32 en route to the national title game. But certainly coach Gregg Marshall hasn’t forgotten that game, and he’ll have his Shockers ready to face the No. 2 seed in the South’s second-round matchup. Wichita State shoots better than 40% from 3-point range on the season and it should be able to hang with Kentucky on the boards. Either way, this promises to be one of the best games of the opening weekend. Only four teams in the country rank in the top 20 of both the adjusted offensive and defensive efficiency metrics. Two are No. 1 seeds, Gonzaga and Villanova. The others? The Wildcats and the Shockers. The Blue Raiders couldn’t have asked for a more favorable path to the Sweet 16. After the Michigan State shocker last year, Middle Tennessee won’t be fazed by a mediocre Big Ten opponent like the Golden Gophers in the first round. Then the Blue Raiders likely will take on No. 4 seed Butler (who’s set to face No. 13 seed Winthrop in the first round). The Bulldogs have a really nice collection of wins (including Villanova twice), but they’ve dropped consecutive games to middle-tier Big East foes Seton Hall and Xavier. 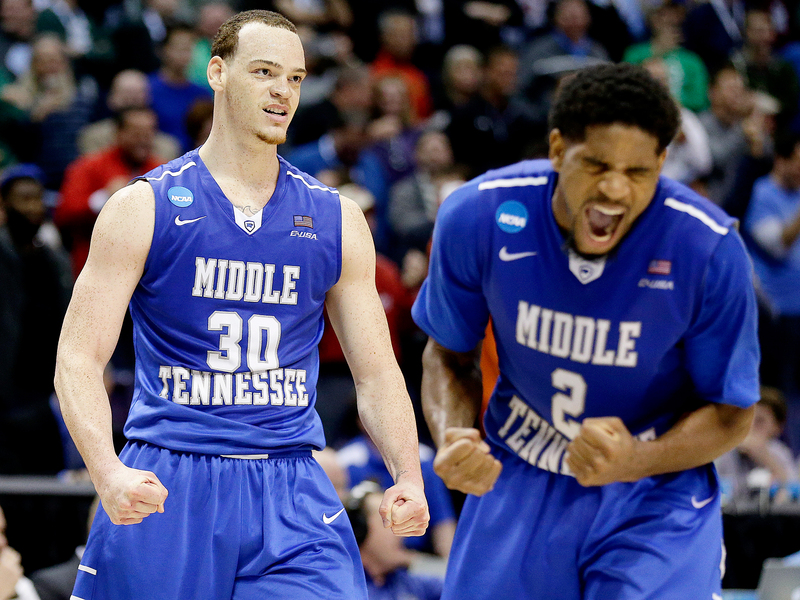 Middle Tennessee will present a bigger challenge than the Pirates or the Musketeers. After storming the A-10 tournament to get themselves off the bubble, the Rams find themselves in a regional where both higher-seeded teams lost star players to season-ending injuries: Creighton hasn’t been the same since Watson tore his ACL in January, and Oregon will have to feel out life without Chris Boucher on the fly after the rangy forward tore his ACL in the Ducks’ Pac-12 tournament loss. Rhode Island’s play on the defensive end of the floor is a big reason why it hasn’t lost in a month, and now only two shorthanded offenses stand between that outfit and the Sweet 16. I’d love to say my alma mater (VCU) but I’m actually worried about the first round there. If a 12 is going to bust into the Sweet 16 this season, I’d put my meager money clip on Middle Tennessee State. That’s a strong team with matchups that don’t seem terribly daunting in Minnesota and (likely) Butler. I do like the Seahawks, and I realize they gave Duke all kinds of fits in the first round last year. But it is impossible to prepare for the kind of tough, efficient defense Virginia plays. If the Cavaliers can hold North Carolina to 43 points, they can lock up anyone. Plus, I like the changes Tony Bennett has made to his rotation, going with a younger, more offensive-minded starting lineup at the end of the ACC season. It’s easy to be down on Virginia, as it has struggled mightily to score the ball and is often as enjoyable to watch as CSPAN at 3 a.m. It’s especially enticing to pick against the Cavaliers when their opponent is UNC-Wilmington, a blur of pressing, tempo and exciting basketball. Don’t fall into the trap. Virginia has the country’s top defense, according to kenpom.com. 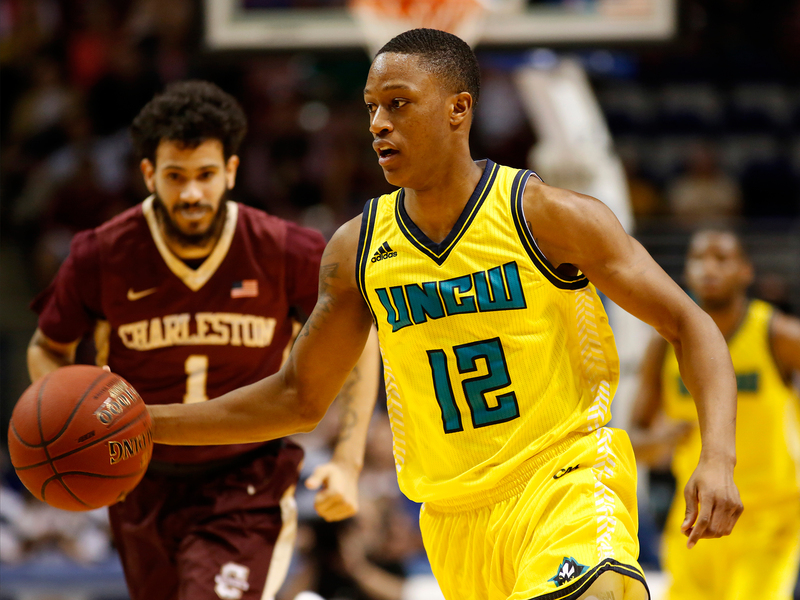 UNCW’s offense is No. 18. Teams unfamiliar with Virginia often struggle adjusting to their defensive intensity and tempo. This will be a close game—all Virginia games are seemingly close—but the Cavs will ultimately prevail. You love Keon Johnson. Of course you do. He's 5'7" and averages 22.5 points per game. This, science has proven, is great. His team, though, didn't come close against the two best teams it played, losing by 14 to Florida State and by 16 to Dayton. Butler isn't perfect, but it swept Villanova in the regular season and it is not the sort of program that will act entitled in an NCAA tournament game. Johnson may go off, but he's just as likely to go away. The Tigers are always a popular Cinderella choice, especially given their role in two of the most memorable first-round games in tourney history, the one-point loss as a No. 16 seed to Georgetown in 1989 and the upset of defending national champion UCLA in 1996. And Princeton just won the first Ivy League tournament, proving that its undefeated run through the conference was no fluke. But none of this year’s Tigers have experience in the NCAAs, which stands in sharp contrast to the Fighting Irish, who have reached the Elite Eight each of the past two seasons thanks in part to players like senior guard V.J. Beachem and junior forward Bonzie Colson, the only player in the ACC who averaged a double-double. Notre Dame survived opening-round scares each of the past two years, beating Northeastern by four in ’15 and Michigan by seven in ’16. The Irish are tested and tough, and it doesn’t hurt that they lead the nation by making 79.9% of their free throws, so they aren’t likely to cost themselves a game down the stretch. You probably remember the Seahawks as the team that pushed Duke in the first round a year ago. They’re lead by a highly regarded coach, Kevin Keatts, who could move on to a bigger job as soon as this off-season. A first-round win over the Cavaliers could mark the beginning of an excellent coda to his stint at UNCW, but don’t expect Keatts to pull it off. While Virginia can get bogged down offensively against a disciplined defense, the Cavaliers should be able to handle the Seahawks’ press by controlling the tempo. Virginia plays at the slowest pace in Division 1. Everyone’s pointing to the clash in styles here as an advantage for the spunky 12-seed, but it is almost impossible to force Tony Bennett’s disciplined teams to play at any speed other than their preferred slog. Are we sure the Seahawks are comfortable with a game that ends in the 60s when they’ve only played three of those in 2017? The Cavaliers may not have been the class of the ACC this year, but their best can still beat any team in the country. As long as London Perrantes isn’t asked to go shot-for-shot with C.J. Bryce down the stretch, the Hoos will survive. The Seahawks are indeed talented and they can score in bunches (six times over 100 this season) but their schedule isn’t dotted with big, scary names. Claflin, Pfeiffer and a full CAA slate aren’t near the level of what they’ll see Thursday. Virginia will be by far the best team UNCW has played this season. Sure, it’s capable of pulling the upset but that isn’t likely.